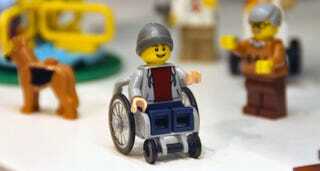 Bowing to public pressure, Lego has finally released its first minifig in a wheelchair. The latest Lego figurine was one of several recently showcased at the Nuremberg Toy Fair. Lego’s decision to create a minifg in a wheelchair did not arise spontaneously from the goodness of this company’s heart. In fact, Lego initially resisted requests from the Toy Like Me campaign to create figures that are more representative of the children who play with its products. Launched last year, the Toy Like Me campaign is an effort to get toy manufacturers to include disabled figures in their sets. It’s already succeeded in convincing Playmobil to release more inclusive characters with disabilities, but Lego was a struggle. Back in December of last year, Lego responded to a Change.org petition with over 20,000 signatures by saying, “The beauty of the Lego system is that children may choose how to use the pieces we offer to build their own stories.” The company, it would now appear, has changed its tune. The new collection, called Fun in the Park, was spotted by Promobricks at the 2016 International Toy Fair in Nuremberg, Germany. Priced at €40 (about $43) the 15-minifig set will hit stores in July 2016. In addition to the figurine in a wheelchair, the set will feature four children and a baby. (The baby is also new, and does not appear in any other set). The front of the packaging shows an idealized heteronormative scenario in which a family is shown hanging out at a public park—mom with baby bottle, of course—while a cyclist and hot dog vendor make an appearance as well. And just to make sure that we’re really, really convinced that Lego has seen the light, the dad—or at least what appears to be the dad—can be seen pushing the baby in a stroller, while a female minifig pushes a lawnmower in the background. The stroller looks a little strange, though. Welcome to modern times, Lego style. Don’t you just feel empowered, ladies?